As a dad, the number of days I get in snowboarding has dropped a bit from the 15-20 days I’ve been getting in since 2010, but I’m still making a trip out to Breckenridge each winter to unwind, get some riding in, and take a lot of photos in what’s easily my favorite place in the world. I was out there from March 2 – 7th, and this time around only took my iPhone and my Pentax P3 film camera, and a good supply of Tri-X 400 and Ektar 100. I’ve not had that film developed yet but can’t wait to see the results. 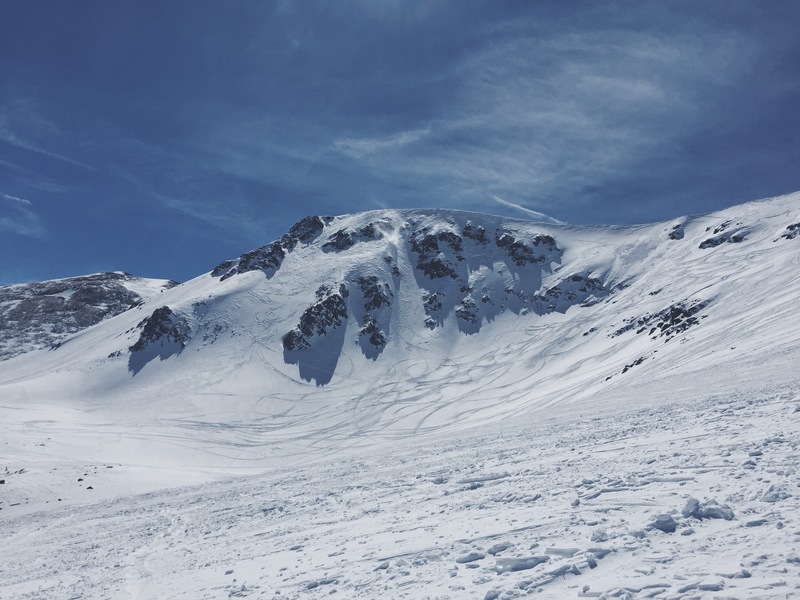 We did three days at Breckenridge, and one day at Arapahoe Basin, which was a new mountain for me, and one I’ll think about for a while. Much like Snowbird, Utah, A-Basin is a mountain that must be incredible with a good dump of fresh snow. We didn’t really have any fresh snow, but still had a great time and did quote a few runs on the lower East Wall, and Montezuma Bowl. As far as our time at Breckenridge, I’ve spent so much time there over the years yet I could never get bored, and always try to get to something I haven’t ridden before. This time around, we managed to find the elusive Needles Eye run off Peak 9, hidden in some incredibly steep trees we’ve ridden the past couple years out there. There are some pics of Needles Eye below. I also finally got up the nerve to do the traverse to Whales Tale from the top of the Imperial Lift, which was a lot of fun. Funny enough, I think I’ve had some minor vertigo for a number of years that always makes me feel sketchy that high up, but I did that on my first day when I was running at full steam, and had fun. We also did a hike to the Back Nine off Peak Nine, to find some untouched snow that had fallen earlier in the week. It takes about 50 minutes to hike out there, and we did the same hike last year. Definitely fun to unstrap and feel accomplished in that way, until you get to the challenging creek-side runout of Rick’s Runout that the Back Nine and Windows runs dump into. It’s one of the few times I really envy skiers. Here’s a collection of photos from the trip, and I’ll have the film photos up in a few weeks once I get them back.